Human CellExp™ BTLA, Human recombinant | 9228 | BioVision, Inc. This protein is fused with a human IgG1 Fc tag at C-terminus and has a calculated MW of 38.7 kDa. The protein migrates as 45-50 kDa in SDS-PAGE due to glycosylation. 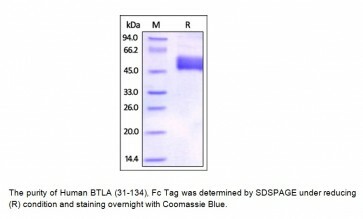 Immobilized Human HVEM, C-Twin Strep Tag at 2 ng/ml (100 µl/well),can bind Human BTLA, Fc Tag with a linear of 0.1-0.5 μg/mL.